A Drawing for July 4th in this free range, freedom-worshipping, libertarian age. 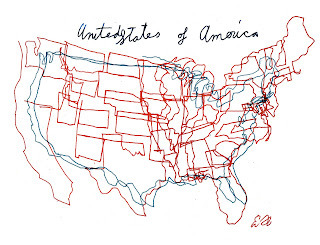 When you try to "free draw" something as complex as the map of the states you find how uneasily they sit together. The shape of one state is supposed to nest perfectly into the next but if you aren't rigorously measuring and following the exact outlines they don't match very well at all. 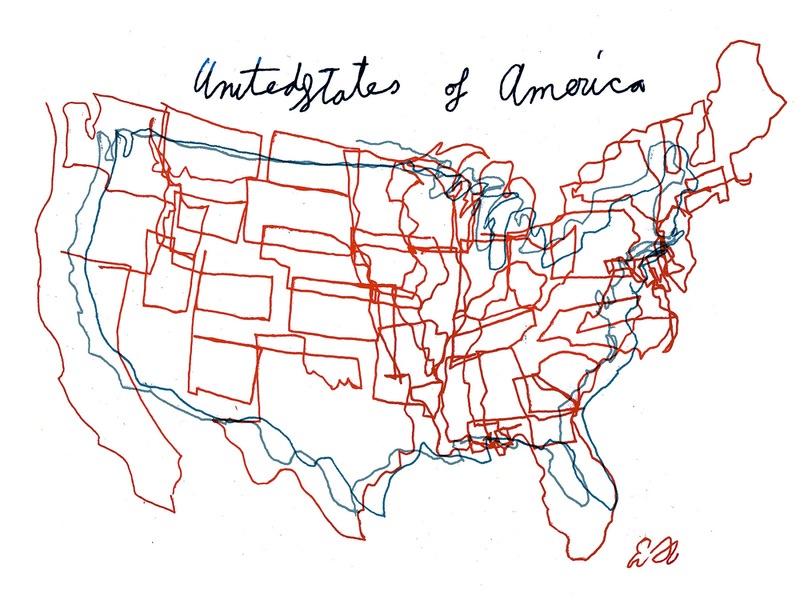 Most Americans don't remember the time before FDR's various bureaus and departments knit the states together, and then Eisenhower's interstate highways locked them into a uniform grid. Then the television networks did the same invisibly and the only things dividing us were the time zones. For a period of four decades or so we really were E Pluribus Unum. Before FDR main roads traveling across one state often disappeared at the state border. Time zones and laws of commerce were willy-nilly. Citizens from the north driving across the south were viewed as foreigners. They were liable (if they weren't careful) to find themselves on the wrong side of the local sheriff. Southerners visiting the north encountered outrageous customs that were almost as outrageous as their own. After a pleasant interval we seem to be disuniting again, in opinions and sentiments if not legally.